From the blossoms of spring to the shimmering heat of summer, through autumn days with trees of flaming gold and into the dazzling light of winter - Lake Wanaka welcomes all comers: adrenaline addicts, foot-sore travellers, lovers of luxury. Here, in the heart of the Southern Lakes, ringed by golden hills, snow-clad peaks, ancient forests, crystal-clear lakes and rivers, you will find the time and space to find yourself. Sip wine at the local vineyard on the lake-shore; spend a day or three fishing one of the great river valleys; up the ante with a little adventure; canyoning, climbing, river surfing, sky-diving; ski your heart out all winter long; or simply idle the days away swimming, cafe-cruising, day dreaming. Through all seasons Lake Wanaka - the heart of the Southern Lakes - beats to its own rhythm. Take time to explore this exquisite piece of real New Zealand and revitalise your spirit. From the ground up, there's adventure with attitude for everyone. Scramble and leap your way down the water-worn groves of a shady canyon or surf a surging river - rapids look even bigger at eye-level. Hang on to your mountain bike as it races away down a tortuous trail or pick your way delicately up the gleaming flanks of Mt Aspiring/Tititea - 'the glistening mountain'. Glide through the soft colours of the sky beneath a parachute; spin through the air in an aerobatic stunt plane. Try something you never thought you would - it's good for your soul. Lake Wanaka invites you to slow down and revel in life's riches: time with friends and family, or soothing solitude amidst the lavish bounty of nature. 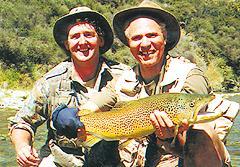 The region's lakes and rivers are famous for their fish: there are some wily old trout lurking in these green waters. Enjoy the company of friends over a game of golf, test your mental mettle at the puzzle centre or trek on horse-back high up into the golden hills where prospectors searched for gold and, years before, Maori wandered in search of pounamu (greenstone). Walking and cycling tracks weave around the lakes and ascend the nearby hills to give spectacular views of Mt Aspiring/Tititea in the distance. Tiny planes offer a bird's-eye view of this magnificent wilderness area. Discover a little of Central Otago's fascinating history: from a raft on the swirling waters of the mighty Clutha River; from a visit to Wanaka's world renowned Fighter Pilot's Museum and fascinating Transport Museum or by sharing an ale with the locals at the Cardrona Valley's historic hotel. Frost-dried powder, slick half-pipes, sweeping bowls, black-diamond chutes or one-piece suits ... whatever your predilection for snow Lake Wanaka, with the largest skiable terrain in Australasia, can match it. A stable continental climate ensures crisp sunny winter days and the stellar terrain makes for fun, reliable skiing all winter. The views from the mountains are endless: out across the islands and inlets of Lake Wanaka or the patchwork green and gold of farmland and row upon row of white-capped peaks stretching to the horizon. The world-class ski resorts of Cardrona and Treble Cone offer quality terrain to suit absolute beginners and hard-core skiers alike. 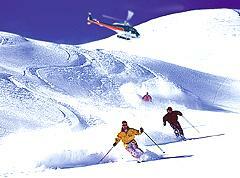 Harris Mountains Heli-skiing will fly you to the best slopes within its 3000 sq km range of pristine peaks. Waiorau Snow Farm is New Zealand's only Nordic and cross-country ski area. Its carefully groomed trails snake across the high Pisa plateau and ski in/ski out accommodation is available for the adventurous. A stay in Lake Wanaka combines the ease and warmth of small town living with the quality and attention to detail of the best resorts. A compact town centre provides easy access to excellent shops, restaurants and services. Quality accommodation is available in any form - from private luxury lodges (with heli-pad), boutique bed & breakfasts and idyllically located hotels to lively backpackers, family motels and tranquil campsites. Lake Wanaka gives you the comforts of home - in paradise. An eclectic range of innovative eating establishments makes full use of the region's growing selection of boutique crops: olives, nuts, truffles and grapes. Award-winning local wines and ales are served alongside the freshest produce: fish from the rivers and venison from the high country. Through summer and autumn the surrounding orchards provide a bountiful pip-fruit harvest. 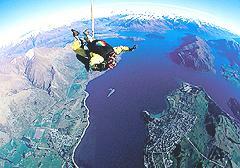 Throughout the year, Lake Wanaka sparkles with a series of spectacular events both fun and daring. The Snow Festival puts the heat on the white heart of winter. At the Pulsate Big Air Competition the world's best extreme skiers and snowboarders bring their outrageous aerial skills to town. 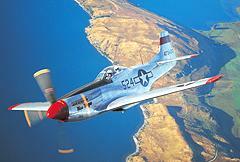 Historic fighter planes take to the skies every second Easter for Warbirds over Wanaka, flying in formation and somersaulting high above the heads of awe-struck onlookers. The biennial Rippon Music Festival rocks the village with music from New Zealand's funkiest bands. Lake Wanaka's high-country heritage is on display at the Agricultural and Pastoral Show and Rodeo. The Annual Hill Climb Rally attracts an elite group of international drivers and the dazzling waters of the lake host the annual Wanaka Yacht Club Regatta. The Lake Wanaka Centre, a purpose built performance and convention venue for exhibitions, cultural events and conferences. 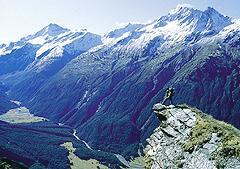 Mt Aspiring National Park, the third largest in New Zealand, stretches from the dense rainforests of Fiordland, across braided river valleys and alpine meadows, to the heavily glaciated Southern Alps. Set within the Te Wahipounamu - South West New Zealand World Heritage Area, it is one of the most spectacular pristine wilderness areas anywhere. The pinnacle of the park is Mt Aspiring/Tititea, rising elegantly from its flanking glaciers to 3027m, a peak much loved by local and international climbers, and by photographers. You don't have to be a mountaineer to enjoy the delights of the park (although any one of a dozen world-class local guides can accompany you to the top). Many gentle walking tracks meander through its open valleys or you can fly overhead and gaze down on golden river flats, forested ridges and spilling glaciers. Lake Wanaka is a natural place to learn; Mt Aspiring College's outdoor pursuits programme draws students from around New Zealand and the International Language Centre draws students from even further afield: Asia, Europe, South America. The Otago Polytechnic utilises Lake Wanaka's outstanding natural resources to run a range of Outdoor Leadership courses. Clear skies and stable weather also provide excellent conditions for learning to fly: both fixed wing and helicopter pilot courses are available. Every year Wanaka's Autumn School brims with creative energy. Tutors from throughout Australasia provide intensive instruction in a range of media: print making, sculpture, Maori weaving, photography. The arts have an ongoing presence in Wanaka through galleries, exhibitions, live theatre, concerts and the colourful local movie theatre 'Cinema Paradiso' where you can recline on a couch, eat home-made ice-cream and enjoy freshly roasted coffee. It's a treat! Wild and beautiful Lake Hawea is a short 15 minute drive from the village en route to Makarora, a major centre for hiking and fishing within Mt Aspiring National Park. 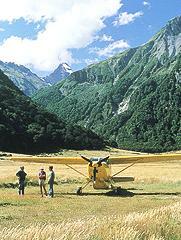 Makaora is 65 km from Wanaka on SH6, linking the Southern Lakes district with the West Coast. 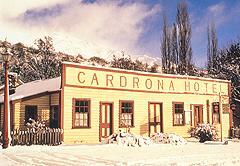 To the south is the historic Cardrona Valley offering a scenic alpine route to Queenstown. Lake Wanaka is an easy 45 minute drive over the spectacular Crown Range, from the closest international airport at Queenstown. For those wishing to enjoy a leisurely trip a visit to the vineyards at Bannockburn, or the orchards at Cromwell on their way from Queenstown or Alexandra, there is a scenic highway alongside Lake Dunstan. The village has its own airport for local flights. International flights arrive in Queenstown from Sydney, Brisbane and Melbourne and domestic flights direct from Auckland and Christchurch. Regular coach and air services connect Queenstown and Wanaka. 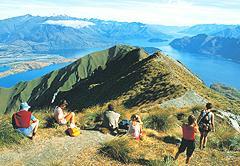 Coaches from all major centres in New Zealand service Wanaka regularly and car hire is available in the village itself. How Warm will it be? Lake Wanaka has a continental climate with four distinct seasons. The weather is fairly dry with spring (September-December) bringing the wettest months. Annual rainfall is 682 mm which is half the national average. In summer the temperature can reach 34° centigrade but averages 23°C. Winter tends to have clear calm days with highs around 10°C. 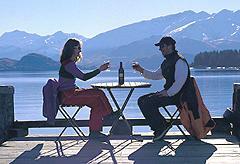 Nights can be cold in Lake Wanaka at any time of year so bring adequate warm clothing. 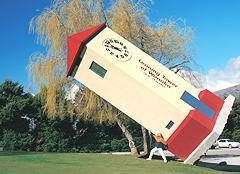 A family motel unit that sleeps four will cost around $NZ120 per night; a hotel room for two around $NZ150; a private apartment around $NZ250 and a backpacker's bed from as low as $NZ16. Please check with the Lake Wanaka Visitor Information Centre. 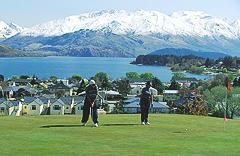 The village of Wanaka is compact and situated on the gently sloping lakeshore. From most accommodation, it is an easy walk to shops and restaurants. Adventure operators will pick you up in the centre of town. If you want to explore further afield, you can readily hire a car or mountain bike. Shopping in Wanaka will provide you with the necessities of life plus a few exciting luxuries. Outdoor sport stores, travel agents and funky clothing outlets stand alongside art galleries and organic health food shops. Major credit cards are accepted and there are a number of banks to assist with changing travellers' cheques or foreign currency. Flying over southern New Zealand, you pass over the glaciated Southern Alps, follow bush-clad ridges down to braided rivers valleys, circle the tussocky hills of high-country farmland and sweep low over the jewel-like lakes of Wanaka, Wakatipu and Te Anau. Towards the coast the sudden cliffs of Fiordland drop into the still waters of Milford Sound and dolphins and seals play on the rocky coast. 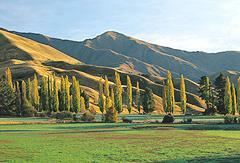 The Southern Lakes region of New Zealand is a dramatic and diverse landscape. 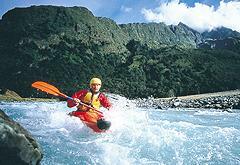 Popular with New Zealand holiday makers and international visitor alike, it has something for everyone. Central Otago's tawny hills are home to some of the world's finest wine makers, most bountiful orchards and old stone cottages from the days of the Otago Gold Rush. Lake Wanaka and Queenstown provide international resorts with flair and heart: snowy winters and glorious summers, adventure activities, music and the arts. Fiordland's primeval forests, sheer granite walls and cascading waterfalls provide the setting for numerous spectacular walks and boat excursions. Explore it all at your leisure.